Just because your closet is overflowing doesn’t mean you can’t store more in there! Do you find that statement hard to believe? Well give me a moment here to explain. Today we’re talking about how to maximize your closet space. Is your closet to the point of no return? Do things fall out when you open the closet door? Do you buy new clothes because you can’t find the ones you want in all of the buried piles of clothes? In what condition are the existing shelves and rods, or are there no shelves or rods? Maybe you’ve placed standalone furniture in your closet to provide some sort of organization. Is it still working for you, or is it buried too? This happens to many of us. We have good intentions, but we never get around to it. There are so many other projects wanting attention. With closets, you can just close the door and hide the inside condition! No one will know. But, each time you open your closet, you are reminded. Get your calendar out right now! You’re going to choose a date and schedule this closet project! The first step is to take action. Don’t put it off — don’t delay because of this reason or that reason. The time is now. In the meantime, consider giving Just Closets a call to schedule a design consult. We’ll sit down together and talk about each closet, your goals and ideas for each, and I’ll offer design ideas and solutions that will maximize the storage in each closet. We’ve blogged several times in the past couple of years about ways to clean out your closets and sort through everything. Check out these posts: How to Purge Your Closet, Fall Closet Organization, and It’s Time to Improve Your Closets. Keep in mind that each bag of clothing or items that you decide to donate or remove, leaves more room for the clothing and items that you love and use all of the time! Eliminating items from your closet obviously creates more space but this post is about more than that. Believe it or not, hanging space is much more efficient than shelving space, so when we are discussing solutions and options, you may want to opt to choose to hang. You will have to hang things you would normally fold and stack. When I first installed rods and double rods in my own closets, I thought I couldn’t get used to it at first but after some practice, I now believe it’s the best option. 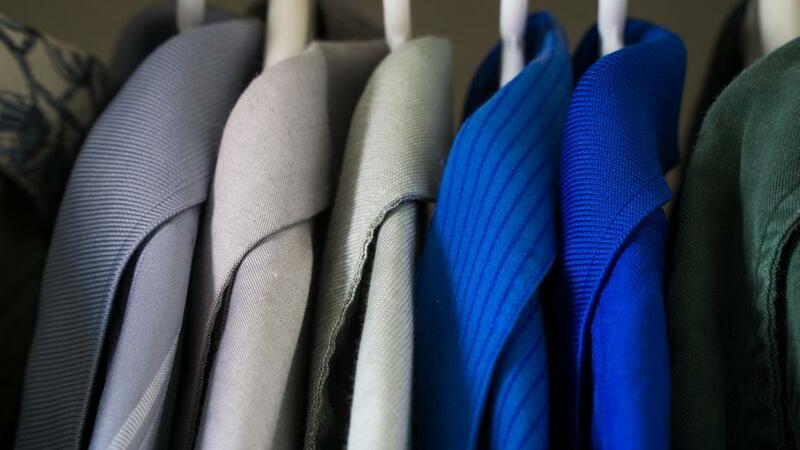 Clothes stay much neater and usually don’t need any ironing when they’re on hangers. Closet systems extend from wall to wall, using every inch of space. I have ideas for using those hard-to-reach corners, which often are catch-alls in most unorganized closets. Another area that we can maximize the use of is floor space. Shelves can organize your shoes, boots, and other items so that this lower area of your closet doesn’t become a ‘dead-zone’. Dividers on shelves and cubbies will help keep stacks of clothes from leaning and falling into other stacks. The area of the closet near the ceiling can also be put to use. A high shelf is not practical, of course, for everyday items, but this can become an organized area for storing off-season or rarely-used items. Containers can be labeled for easy reference. Are you starting to see where a custom closet system can really pay off? Our expertise in closet design will ensure every bit of space is used and functional. An organized system will help you to keep your closet from getting disorganized. Everything will have its place. You will be able to see all of your items and not have to ‘dig’ for them. Your closet will look so good, that you will want to leave the door open from now on!